On the desktop, type system in the Search box. This box is located on the left side of the taskbar. The Search panel appears. Select System-Control Panel in the Search panel. The System window shown appears. Windows edition: Of course, you have Windows 10. However, Windows 10 comes in two primary editions: the Home edition, which you are likely to have, and the Pro edition, for computer professionals. You may find information here about so-called Service Packs, which are large collections of updates to Windows 10. System: This section displays details about your hardware, including the processor, the amount of installed memory (RAM), and other details. Computer name, domain, and workgroup settings: This information pertains to your network, if you have one. If a computer can’t connect to a network, the problem is often related to the name of the Workgroup (a network). The Change Settings function lets you change the Workgroup name to match other computers on the same network. 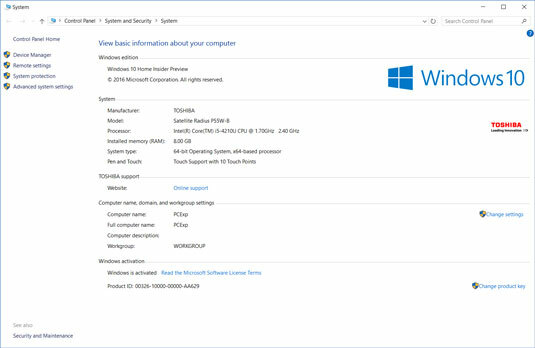 Windows activation: In an effort to control software piracy involving bootlegged copies of Windows 10, each copy of Windows 10 must be activated. Odds are that you activated your copy the first time you started your computer. If you don’t see Windows is activated in this section, select the adjacent link. Don’t be alarmed by the System information and options. If all goes well, you don’t have to use most of what you find here.